If you are a company or brand who would like to take part in the event please contact me at wovenbywords@gmail.com . 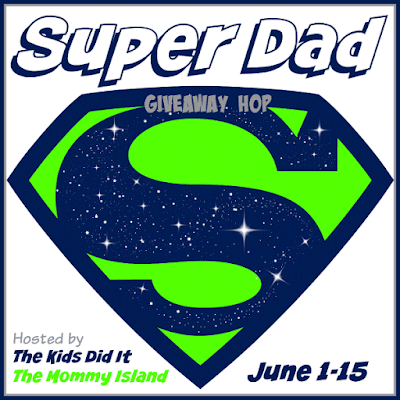 The Kids Did It and The Mommy Island are hosting the “Super Dad!” Giveaway Hop from June 1st at 12:01 am EST thru June 15th at 11:59 pm EST! All bloggers are invited to join us as this is a FREE event with a Father’s Day theme and a $15 prize minimum! Scroll down and add your BLOG NAME to the linky below! Theme Details: We are pretty open when it comes to the prize. As long as a father or dad-to-be would love it then you can give it away! Books and e-books are great however if your prize is an e-book include a $10 Paypal or Amazon gift card as well. (Authors and book bloggers encouraged to sign up!) Ideas: Books, DVDs (portable DVD players), wallets, car care, grilling/outdoors, grooming products, clothes, peace and quiet, beer..? Each blogger is responsible for securing their own prize and running a giveaway EXCLUSIVELY FOR THIS HOP! NO GROUP GIVEAWAY ALLOWED – THIS MEANS YOU JOIN ANOTHER BLOGGER’S GIVEAWAY TO PROMOTE IN EXCHANGE FOR A LINK AND YOU LIST IT ON OUR HOP AS YOUR OWN. You will be removed from the link if this isn’t followed. Participating bloggers can host multiple prize packs. Prizes can be sponsored or self-sponsored. There is a $15 PRIZE MINIMUM for this event. We recommendhaving no mandatory entry. The Linky list must be VISIBLE in your post, as well as any required information sent via the Google Doc. before the start of the hop. COMPLETE Giveaway Post must be live and reported by 9 PM EST on 05/31 or you will be removed from the Linky. Not posting required information will result in you being removed from the event. You are required to report your Direct Link to your giveaway before the event begins via a Google Doc. If your link is not reported in the Google Doc. you will be removed. We are not able to hunt down your link. No requirements to post sign ups or sidebar buttons to promote but the more bloggers, the bigger the event, so posting the button or sharing on your social media including Facebook, Pinterest, Twitter and G+ is encouraged! DEADLINE : Sign ups close on May 30, 2016. Details emailed by May 25, 2016 or grab in our Facebook Group anytime! It is YOUR responsibility to obtain the hop information. Cost – As of now our events are free to join but may change in the future.